The first manned flight of Project Gemini launched on March 23, 1965 with pioneering astronauts Gus Grissom and John Young. Take a look back! Apollo 9 put the lunar landing module Spider through the stresses of spaceflight while orbiting Earth. This documentary looks back with astronauts Jim McDivitt, Dave Scott, and Rusty Schweickart. The Russian Soyuz spacecraft with Expedition 15 cosmonauts Fyodor Yurchikhin and Oleg Kotov, along with tourist Charles Simonyi, fly to the space station. One of the most daunting yet crucial human spaceflights occurred in December 1993 as the crew of shuttle Endeavour embarked on a mission to repair the Hubble Space Telescope. Narrating a highlights film from their STS-51 mission, the astronauts from Discovery's September 1993 flight describe launching an advanced communications satellite and a German telescope. An Italian gamma ray observatory hitched a ride to space aboard an Indian rocket today, beginning a three-year mission to survey the sky in a search for faraway sources of the Universe's most energetic form of light. The AGILE satellite flew into orbit on top of India's Polar Satellite Launch Vehicle. 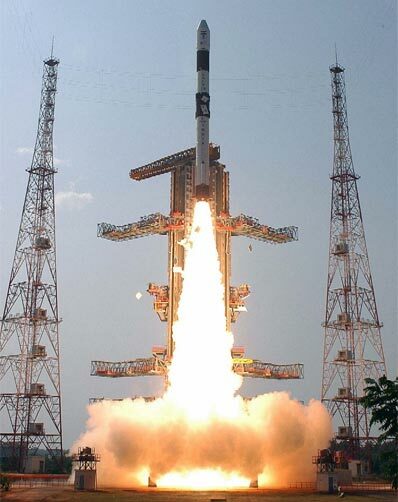 Liftoff was at 1000 GMT (6:00 a.m. EDT) from the Satish Dhawan Space Center at Sriharikota on India's eastern coast. The 776-pound craft separated from the four-stage PSLV booster about 23 minutes after launch. The rocket was targeting an orbit approximately 342 miles high with an inclination of 2.5 degrees, according to Indian officials. An avionics package was housed inside a dual-payload adapter to test advanced computer, navigation and telemetry systems, but the equipment remained attached to the rocket's fourth stage. The rocket flew without the six standard solid rocket boosters attached around the base of the launcher - a first for the PSLV. 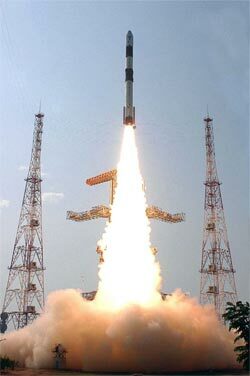 Today's launch was the 11th flight of the PSLV since its 1993 debut. 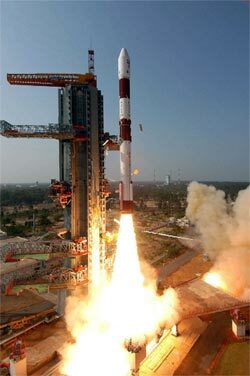 The mission was the first commercial launch conducted by India's space program. Earlier PSLV missions launched small foreign spacecraft, but today was the first time a paying customer's satellite filled the role of a primary payload. Paid for by the Italian Space Agency, AGILE's array of scientific instruments will detect high-energy emissions from the most far-flung regions of the Universe. AGILE carries a gamma ray imager, an X-ray detector, and a device called a mini-calorimeter to hunt for transient events such as gamma ray bursts, the most powerful explosions in the Universe. The combination of gamma ray and X-ray detectors will give scientists a unique tool to perform synchronized observations in both energy bands. The AGILE instrument is the most compact and low-power science payload ever developed in high energy astrophysics, officials said. The science package will provide data continuity to build upon discoveries made by NASA's Compton Gamma Ray Observatory. Part of the U.S. space agency's Great Observatories program, the satellite was deliberately crashed into Earth's atmosphere in 2000 due to fears of an uncontrolled reentry. AGILE science data will also help astronomers lay the foundation for GLAST, a follow-on NASA mission scheduled to launch in December with more advanced gamma ray detection instruments. Gamma ray sources identified by AGILE could become the first science targets for GLAST. AGILE covers an energy bandwidth not observed since the end of Compton's mission. Other recent gamma ray telescopes have mostly focused on lower energy bands, according to the AGILE science team. The spacecraft can quickly detect and respond to sudden events like gamma ray bursts. AGILE's science team will immediately send information on such events to both ground- and space-based telescopes for complementary observations. Scientists expect at least one gamma ray burst per month will be detected by AGILE. The bursts, which usually last just several minutes, are mysterious explosions scattered throughout the Universe. AGILE will be able to send alerts with burst coordinates to other observatories within seconds of the initial event, according to the mission's science team. AGILE will send the alerts back to Earth through the ORBCOMM communications satellite constellation when the satellite is not linked to a ground station. The AGILE instrument can survey up to one-quarter of the sky at a time, which surpasses the field of view of any previous gamma ray research mission. The wide field of view will give scientists a better opportunity to simultaneously look for unidentified gamma ray bursts and observe multiple known targets such as supernova remnants and objects near the center of the Milky Way galaxy. The craft's payload is also about twice as sensitive to gamma ray waves than the Energetic Gamma Ray Experiment Telescope, Compton's primary instrument. EGRET, which weighed more than 4,000 pounds on the ground, was much larger than the entire science payload aboard AGILE. The craft's instrument weighs less than 300 pounds on Earth. AGILE will be pressed into service late this summer after a few months of tests.